I just liked it all. All? Yes, I just fall in love Steven Tai pieces for next warmer season what I have shared yesterday. Oh no guys! I am not 16 but who cares? Organza jackets, blouses and high-waisted trousers are totally ageless they do not necessarily follow that girly but absolutely playful. So inspired and reminds me my last surprise from Sammydress. It was an organza baseball jacket. Organza baseball jacket? How cool! Believe I know what I am talking about here because I am crazy for these kind of incredible mixes? Fashion is just a game, is not it? 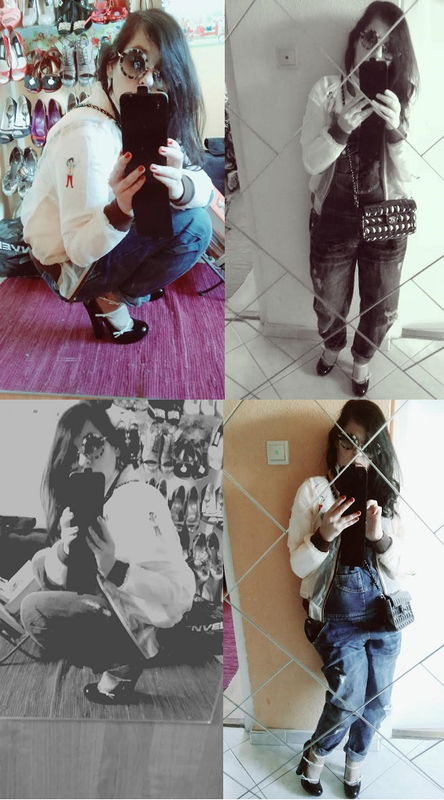 Certainly you noticed that I like to combine - high fashion - (mostly in unique accessories) and cheaper clothes into each outfit as you can see on my Monday and the weekdays posts. Back to the hiper lovely bomber jacket from Sammydress. It seems almost logical that it will be succesful and just working great and unique. Unique is most important in my wardrobe - consistently in my daily outfits. Get a chance to show my new ensemble that has a root this little embroidered (illustrated by itty-pitty multicolor guys) and funny jacket. I am crazy happy that this cute bomber (school girl?) is landing into my closet. I picked up one of my favorite dungarees and put an perfect tailored long sleeved top and a pair of hiper ladylike shoes. I think my outfit will equal my real style. Little bit ladylike but just get a vintage vibe ... none too boring, what do you think? Amazing look! Love the shoes! LOVE everything about this look - the shoes add such an extra fabulous splash of oomph!